The World Nomad Games is an utterly incredible, one-of-a-kind event that began in 2014 to preserve and promote traditional nomadic culture across Central Asia. The event has expanded to include 3000 athletes representing over 70 nations. 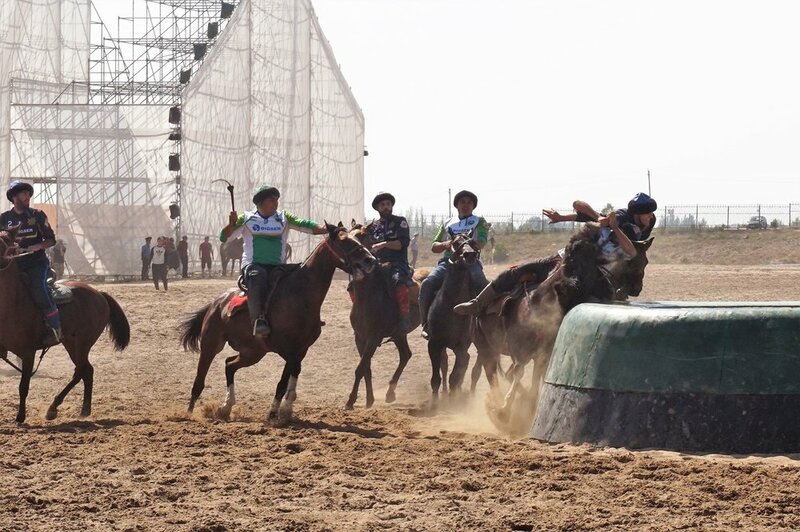 The last three competitions have been held next to the picturesque lake Issyk-kul in Kyrgyzstan but in 2020 the Nomad Games will move to Turkey. We were lucky enough to catch the last World Nomad Games held in Kyrgyzstan and were absolutely in awe at this insane week of colour, music, bizarre sports, food, horses, eagles, traditional clothing, yurts and so many brilliant hats! Unfortunately we can’t give any tips for attending the Nomad Games in 2020 as there is nothing confirmed yet and the event in Turkey will be very different to the one in Kyrgyzstan. But we’re sure they will be just as amazing and you should definitely make plans to head there! To inspire you more here is our account of our time at the World Nomad Games 2018. The World Nomad Games took place across four main arenas based around Cholpon-Ata, a popular Russian holiday destination on the shores of lake Issyk-Kul. Each venue was home to a different series of events but all were free to enter. This was by far our favourite venue. The Kyrchyn valley is around 40 minutes from Cholpon Ata and is a beautiful setting for the yurt camps. Over 500 yurts gathered to form the village which included stages, markets, food stalls and games. A walk through the village was a sensory overload, you could be invited into yurts to eat with local families, shop for handmade felt goods, watch traditional dance performances or take photos of locals enjoying games in their kalpaks (Kyrgyz hats). It was also the venue for the eagle hunting and horseback archery which took place right at the end of the valley with gorgeous views of the mountains in the background. The village had a main stage area which was used for the opening ceremony as well as several cultural performances including throat singing and a weird poetry competition which sounded like a mixture of rap and traditional prose. There were also yurt areas for different countries and you could sit and have tea with people from the UAE or pop next door and do some karaoke with the USA delegation. Custom built just outside of Cholpon Ata is the magnificent hippodrome which is used for all the horse sports and opening and closing ceremonies. I’d never been in a hippodrome before so it was pretty exciting to see and the crowds made it even more special. Rows upon rows of Kyrgyz men in their kalpaks cheering for anything and everything while children ran up and down the aisles. The sports in the hippodrome were truly obscure but weirdly enthralling and we spent hours watching kok-boru matches and horse wrestling. There were also all kinds of horse racing and stunt displays between the sports to keep viewers entertained. The indoor sports centre was a modern centre with stands on one side and the wrestling mats on the other. This arena was always packed as wrestling seemed to be one of the most popular sports here in Central Asia. There was also an outdoor stage where they held events and medal ceremonies. We never visited here during our trip to the World Nomad games simply because there was way too much happening everywhere else! But this was home to the strategy and board games which went on for the entire week. There were over 37 different sports played at the World Nomad Games 2018 so I’m not about to go in depth into all of them. But I wanted to give an overview and share some pictures of some of the more interesting, bizarre and challenging sports we witnessed during our week at the games. When you plan your trip to the World Nomad Games you’ll no doubt hear and see many things about the national sport of Kyrgyzstan – kok-boru (or as foreigners like to call it ‘dead goat polo’). The sport is played by two teams on horseback and I definitely saw some resemblance to rugby when the teams were evenly matched. The ‘ball’ is a 35kg goat carcass sans head that is thrown into the pit-like goal at either end to score a point. Kyrgyzstan and Kazakhstan are known to be the best teams in the competition although while we were there Uzbekistan made it to the final. There is also a small movement of international teams from further afield (although it’s a bit hard to practice) and the USA team were favourites with the crowd. Let’s face it, it’s the photos of the giant eagle, wings spread on the arm of a man in a kalpak (Kyrgyz hat) which gets us all excited for the Nomad Games event. The eagle hunting was a really fun and interesting event to watch but the photo opportunities weren’t what they promised. There’s a falconry event in which the trainer swings some bait on a rope and the falcon is awarded a point for every time it touches the bait during its circle of flight. Some of the competitors’ birds were more cooperative than others with a couple of them using the opportunity for freedom and running (or flying) for the hills! The larger eagles are by far the most impressive and are sent to chase a fox carcass pulled along by a man on a horse. At times the eagle soars low over the crowd before heading in for the catch. The first rule of the archery competitions is that participants must be dressed in traditional clothing from their country and use a bow and arrow made only from wood. These stipulations immediately add an epicness to the competition and transport you back several hundred years just by sitting in the crowd. In the target archery men and women clad in the traditional garb of Mongolia, Turkey, China, Germany, Kazakhstan and many others take to the line and release their arrows in soaring arcs (some more accurate than others) towards the targets. This is a fun photo opportunity but the calibre of archery wasn’t exactly world class and everyone was really there for the main attraction, the horseback archery. Nothing screams nomadic tribes and cultural sporting events like a traditionally dressed warrior on horseback firing a bow and arrow. And the best part is there are badass women competing too, conjuring images of Joan of Arc or for the Disney fans among us, Mulan. The wrestling was the most modern-day sport of the World Nomad Games but still managed to incorporate wrestling styles from several different countries across six days. There were both women’s and men’s competitions and some of them were really fierce. Taking it back to more nomadic style was the wrestling on horseback. The competitors had to try and wrestle the opponent of his horse all while the referee sat nobly on his horse watching the action. It was impossible to see everything that was going on at this week long cultural, sporting melting pot of events. And even more impossible to try and capture it all in pictures and words. All I can say is that you need to see it to believe and although the Turkish version is bound to be very different I’m sure it will have it’s own kind of magic. I’ll update here when I find out any details about when/where the next World Nomad Games will be held.